As much as Latinos contribute to this country, their tastiest contributions are some you shouldn’t miss out on this Hispanic Heritage. Latinos celebrate their culture through food, music, history, traditions and art Sept. 15 to Oct. 15. Costa Rica, El Salvador, Mexico, Chile, Guatemala, Honduras and Nicaragua also celebrate their independence. With food being such an integral part of Latin American culture, here are five authentic dishes that’ll have you celebrating, whether you’re Hispanic or not. Not to be confused with a gordita or an arepa, you can travel with one of these in your hand without making a mess in your car. This cheesy goodness comes from El Salvador, but it can be found all over the Dallas-Fort Worth metroplex. It’s a thick pouch made of masa, a corn based flour dough, stuffed with one or two fillings and lots of cheese. But the pupusa revuelta, stuffed with pork and cheese is the traditional one. 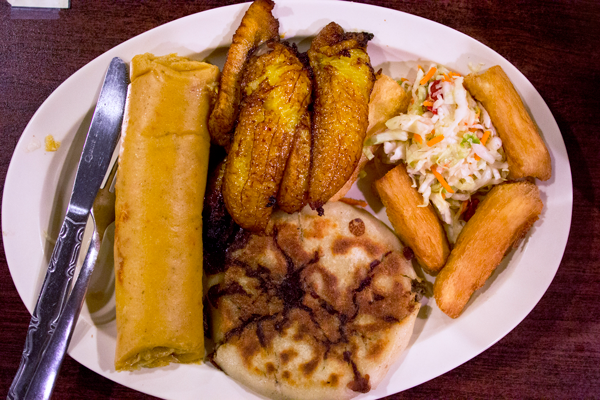 As the pupusa grows in popularity, so does its list of fillings. For those who aren’t fans of pork, there are bean, chicken, spinach and loroco (an edible flower imported from El Salvador) varieties. Pupusas are typically served with curtido, a spicy fermented relish, and a tomato-based hot sauce. The cooking time for one of these is about eight minutes on the griddle. You end up with a filled tortilla that’s crunchy on the outside but gooey on the inside. We all know about tacos and, although no one can negate their deliciousness, there are so many more tasty dishes from Mexico. The spice-enriched sauce comes in yellow, red, black and sometimes green colors based on the nut, spice and chile mix. One of the many varieties, mole poblano, originated from Puebla. What gives this mole its rich flavor is the emulsion between chocolates and chilies. It is typically served with rice and chicken or even enchiladas and burritos. If you want a rich, thick sauce get the spice mix straight from Mexico and expect it to come with a punch. Although many Latin countries have their own take on this popular seafood dish, Peruvians are so obsessed with their national dish they created a national holiday for it too. 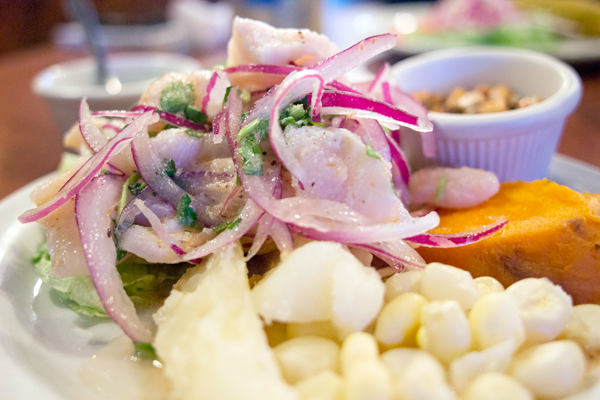 Ceviche was devised when Spaniards introduced limes to Peru. The Peruvian lime is one of the most important ingredients in this dish because it is used to cure the fresh raw fish. Most ceviche is made with a variety of large fish as the protein, accompanied by onions, salt, cilantro, spiced with aji and chili peppers. The sweet onion balances the acidity of the dish. The toasted corn nuts, knows as canchas, are a break from the soft and chewy texture from the rest of the dish. According to Esperanza Gamarra, a cook at Inca Café who grew up making ceviche, corvina (cod) or seabass make the best ceviche due to their firm white flesh. She said the “cooking” method works because the lime coagulates proteins in the fish, which is what happens when you actually cook it with heat. Although the gummy texture of the raw fish can turn some down, the lime gets rid of any smell and it becomes a fresh and light appetizer with a bit of spice. Like other tropical countries, plantains are found in many Puerto Rican dishes. The plantains are fried until there’s a dark brown crisp exterior with a dense and yellow inside. In mofongo, plantains and sometimes yucca are fried and mashed with salt, garlic and chicharron, or fried pork rinds. This serves as the dome-shaped firm covering stuffed or topped with vegetables, chicken, shrimp, beef or octopus. Although the dish includes plantains, which produce a sweet caramelized taste, this dish is more savory because of the toppings and broth. It sits on a serving of chicken broth soup, Creole sauce or braised meat. Cubans are known for cigars and coffee, but they also boast a diverse cuisine. Literally translating to “old clothes” in Spanish, the national dish, ropa vieja, is over 500 years old. It’s basically shreds of seasoned meat and sautéed garbanzos served in a flavorful tomato sauce base. The meat rips apart easily like old clothes, which explains the name. The savory taste comes from the sofrito. The shredded flank steak stew is typically accompanied with black beans, rice, plantains or tostones (plantain chips) and a piece of Cuban bread to soak up the flavor. 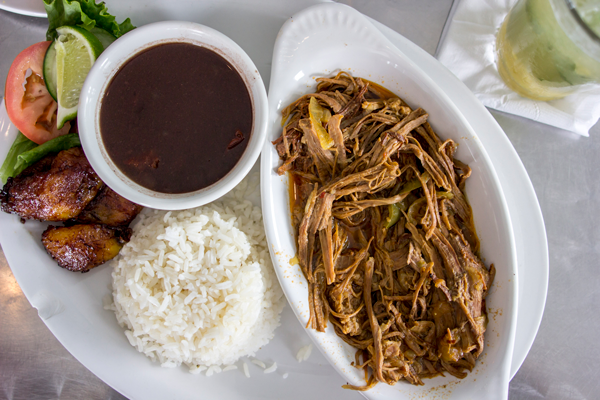 Ropa vieja got its name from the popular legend about an extremely poor man who couldn’t afford food for his family. Out of desperation he shred up his clothes and put them in a pot. Once he opened it he found that the rags magically became the tasty beef stew we know today.